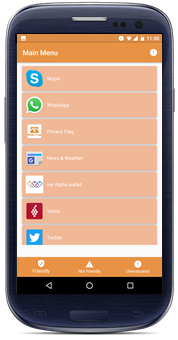 The Privacy Flag smartphone application allows users to “gather” information on potential privacy risks from installed applications in their Android-powered mobile phones and tablets. 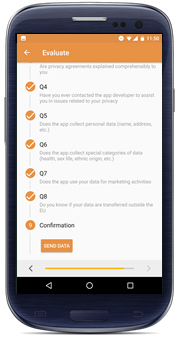 The application informs users whether installed software is considered as “privacy friendly”, or as “not privacy friendly”, based on the analysis conducted by the Privacy Flag backend system. The analysis includes input gathered by technical enablers and exploits the power of crowdsourcing data from end-users using the UPRAAM methodology. In combination with the Privacy Flag web browser add-on, the smartphone application is one of the main points of interaction between end-users and the Privacy Flag project. Click here to download the Privacy Flag app from Google Play for Android devices.